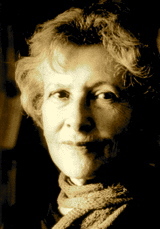 A Year of Being Here: Denise Levertov: "For the New Year, 1981"
"For the New Year, 1981" by Denise Levertov. Text as published in Making Peace, anti-war poems by Denise Levertov, edited by Peggy Rosenthal (New Directions Publishing, 2006). Art credit: "Refracted Light," photograph by Comstock/Getty Images.